We are connected, one to another, in ways that the physical world can't explain. We often know when someone is staring at us. Enough children remember previous lives to suggest reincarnation happens sometimes. People see ghosts and angels. Mothers save children by lifting cars off them. St. Teresa of Avila floated in the air in full view of dozens of witnesses. They usually could hold her down, but not always. It's not one thing. It's everything all together that shows that we all have souls. And that's what this book does -- puts everything (well, a lot of things) together to show that souls are the best explanation for what we experience. The book is not religious. But it suggests how acknowledging we all have souls can help us lead healthier, happier, and more connected lives. It looks at some deep philosophical ideas, including the nature of proof, but it's written in simple English. It answers important questions, but asks questions, too. It reminds us what we know now and leads us to places where we can learn more. We All Have Souls is a book that wishes to change the world. 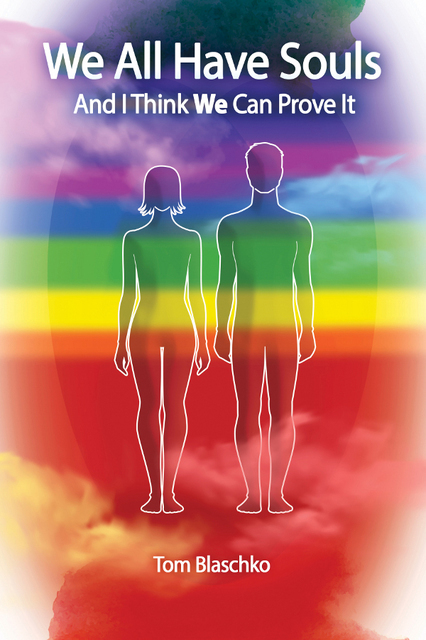 It looks at what souls might be and how science and common experiences prove that they exist. It offers a path to more loving and fulfilling relationships. When you read the book, you can add to the proof that we all have souls. Tom Blaschko has been interested in souls, soul reality, and reawakening our world since before he was born. In this life he has 47 years of experience with ki (chi) in Tsutomu Ohshima's Shotokan Karate, a BS in Astronomy from Caltech, and an MS in Psychology from SUNY Buffalo. He has also studied with the Incan shaman Adolfo Ttito Condori, American shamans Betsy Bergstrom and Ana Larramendi, Incarnational Spirituality teacher David Spangler, tree spirits, a Sidhe or two, and other beings, human and not, who are part of soul reality. I read every word and felt you have followed your wish, to make the world better. Anyone with an open mind who reads this can gain understanding and peace from it. It will be widely read and practiced. Your exercises will entice everyone to try them. Fascinating book! I particularly liked your closing section, "My Vision," because it's so positive and uplifting. I really enjoyed the subject matter of this book. One of my first selfish insights was that We All Have Souls is a great compliment to my book, The Subconscious, the Divine and Me. My focus has always been on personal experience of the subconscious and meditative worlds. This book fills the gap of rational and cognitive analysis--something my work has always lacked. I greatly appreciated your decision to present this material in layman's language. It made it an easy read for me and will appeal to a wide audience. I am very impressed by your new opus. It's a very thought-provoking exploration of what many humans give lip service to but rarely scratch the surface. You state a very compelling case for soul/body reality while incorporating your own experiences. I particularly liked the exercises scattered throughout the chapters: good to initiate activity that leads to introspection. Your depiction of hoocha was great. It's what astrologers talk about when mercury goes retrograde. Stuff just gets in your way for the most illogical reasons!